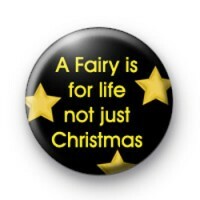 A fairy is for life, not just for Christmas badge in black with yellow text. This badge also features 3 yellow stars in the top corner. This 25mm pin button badge is hand made in our UK workshop. We have a great range of Christmas badges so be sure to check them out.